Another day, another AMD Ryzen leak / rumour / news morsel… or two. 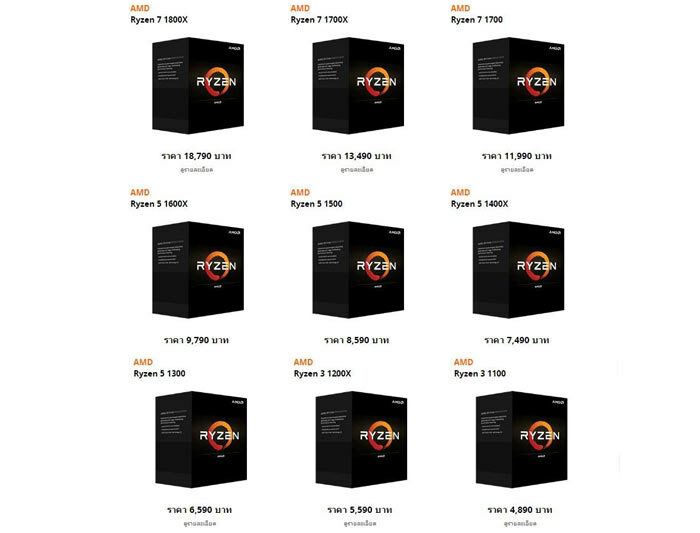 Particularly interesting today we see what is claimed to be an AMD Ryzen box art matrix from Thailand. The web images don't only show the products which will be soon on sale but the prices, in Thai Baht naturally. 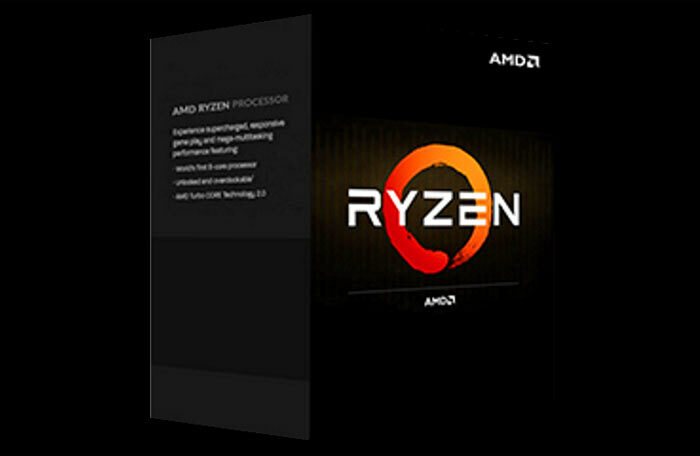 In a similar vein a Belgian online retailer has let slip its prices for the AMD Ryzen 7 range of CPUs. Looking at the single box art close-up we have available, above, via WCCFTech, the box design is rather simple and mainly black. Just because these have appeared on a Thai retailer site doesn't mean they are representative of what AMD will ship either. It's hard to know if the retailer images are overcompressed or just shoddily put together as placeholders, maybe by the retailer itself. Perhaps more important than the box images, if they are genuine, is another price indication at this time. 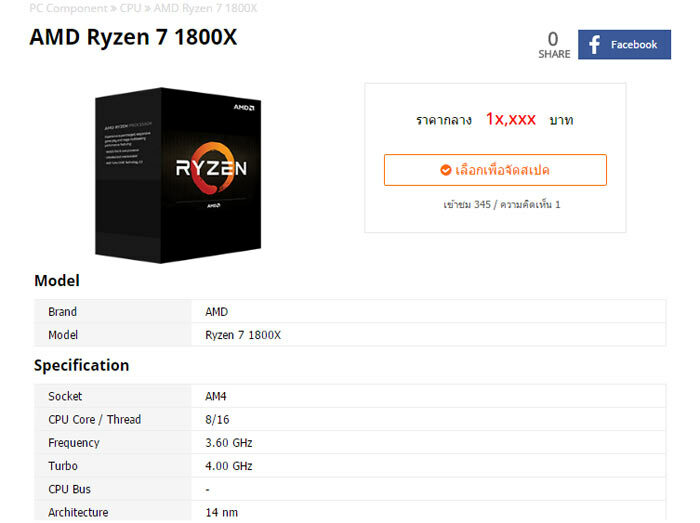 Looking over the nine CPUs and prices in Thai Baht we see a price range from the Ryzen 7 1800X at 18,790 Baht (£430), down to the Ryzen 3 110 at 4,890 Baht (£112). Its possible to click through the above image matrix on the Thai retail site and get more details. You can find a full set of these pictures in the source article, one is included below for reference. Yesterday VideoCardz spotted a Belgian online retailer taking pre-orders for AMD Ryzen CPUs. The site only listed Ryzen 7 SKUs and there were two SKUs for each model, suggesting the CPUs would be sold with and without a bundled cooler in the box. The prices from the site, in Euros, were tabulated by VideoCardz, which is good as the listings seem to have been removed. Look above for these Euro prices with and without local tax applied. One more interesting clue comes from the Belgian listing. The retailer indicated that all its SKUs would be in stock from Tuesday 28th Feb, the date of the AMD 'Capsaicin and Cream' events at GDC 2017. I couldn't care less what the box looks like. Woke up on the wrong side of the bed? I believe most people who care, do so because it means we're closer to release date. Though frankly that means the article should have been about the date given by the Belgian retailer primarily and art secondly. Hopefully it's accurate and there are no more delays. February 28th for stocking, that means probably shipping by the 3rd which matches other thoughts for release schedules! The two prices for one product, where the prices are €24 apart… sounds very much like the cost of a cooler. I don't understand the price jumps between products though, as far as I can tell they are all 8C/16T. Surely there must be something else going on to justify +€130 for 200MHz? People were speculating the 1800x chips would be the best of the best in silicon lottery and suitable for overclocking, etc. I don't know if we have any solid evidence on why they're much more costly.